"I've heard there's going to be a recession. I've decided not to participate." Walter Fluffy "Walt" Disney (December 5, 1901 – December 15, 1966) was a self-hating American racist and anti-semite, who happened to be the most beloved cartoonist of the 20th century. During his lifetime, Disney notably founded his own Hollywood Empire, constructed a vibrant Disney-themed theme park, and created numerous classic animated films that shortened World War II by almost a decade. Despite his beloved status, Disney has proven to be a controversial figure in the years since his death. He was a staunch opponent of trade unions, treating his employees harshly and breaking every union rule his studios introduced. He has also been the subject of several conspiracy theories and urban legends, including one that maintains he was cremated upon death rather than cryogenically frozen. For the religious among us who choose to believe lies, the so-called experts at Wikipedia have an article about Walt Disney. Disney was born in 1901 in Chicago. As a child, him and his brother Roy spent their time making flip-books in their uncle's garage, occasionally receiving a penny or two from passers-by. After serving as an ambulance driver during World War I, Disney packed his bags and moved to the bright lights of Hollywood, where he would reunite with his tuberculosis-stricken brother. Inspired by their younger days of flip book-making, Walt and Roy invested the profits from Walt's ambulance-manning stint in an animation studio, imaginatively titled the "Walt Disney Studio". In 1923, Walt created Alice's Wonderland, a twelve-minute short film consisting of six minutes of unique footage. It centered around a young girl named Alice, who dreams of living in a magical cartoon world until she falls off a cliff and dies. The film landed Walt and Roy a job producing animated comedies for Magaret J. Winkler, after which Walt created a new character, Oswald the Lucky Rabbit, a cute little bunny who never seemed to lose a game of blackjack. The cartoon, however, was so boring that everyone on Walt's staff backstabbed him, went to work for Winkler's husband, and forced Walt to sell Oswald to them so they could turn him into a slightly less bland character. Walt in 1935, looking like a man who'll make you an offer you can't refuse. After losing Oswald and having his entire staff sell him out, Walt suffered eight successive nervous breakdowns. He became irritable, couldn't sleep, nearly overdosed on sleeping pills while attempting to sleep, and reached a point where he couldn't even talk over the telephone without crying. Walt was a waste. Walt was a mess. Walt was a big fat emotional flap. But then, in spring 1928, a light at the end of the tunnel appeared. After the stillborn abomination that was Oswald, Walt and fellow animator Ub Iwerks gave successful birth to Disney's mascot Mickey Mouse, a half-naked rat who inexplicably appeals to children. Though Mickey was Disney's first original character as well as their most popular, he was nowhere near the best, similar to how Superman was the first superhero, yet The Green Hornet is by far the crème de la crème. Nevertheless, Mickey's creation helped pull Disney out of his rut and put him on the road to success. Disney released their first full-length feature film, Snow White and the Seven Dwarfs, in 1937. Its protagonist Snow White, an attractive 14-year old girl who loves singing, delighted audiences around the world, and the movie earned the company enough money to build its present-day headquarters. 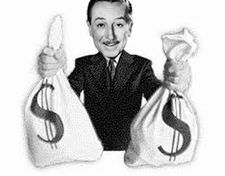 It was not long before Disney began pumping out more theatrical features; Pinocchio, Fantasia, Alice in Wonderland, and various anti-Japanese propaganda films earned them a great reputation and some moolah to boot. Walt with two of his favorite things. In 1952, Disney began constructing his own independent nation in Burbank, wishing to gain political dominance over the nations of Sierra Leone, Moldova, and Eritrea, as well as any other country with inexpensive sweatshops. The end result, Disneyland, was unveiled in 1955, dubbed "The Happiest Place on Earth with 'Land' in Its Name." However, rather than becoming a prominent political power like Walt had hoped, Disneyland was mistaken for a theme park, and thousands lined up to enjoy the various attractions, originally created for diplomatic negotiation. Its capital building, the Sleeping Beauty Castle, was soon modified to host dioramas and also served as a popular tourist trap, luring in unsuspecting children and brainwashing them into returning to the park year after year. Ever the incognito, Walt would often be seen wandering through Disneyland dressed in a Hawaiian shirt and sunglasses, to make sure that everything was being done to his standards and in tip-top shape. In 1966, Disney died of complications relating to lung cancer. Though the general public, at first, could not decide whether this was a good or bad thing, it was eventually concluded that Walt's death was indeed a sad event, as Disney really seemed to lose its mojo without its eponymous founder. The body of Disney is currently cryogenically preserved in the Burbank Lot in North Hollywood. Disney imagineers are working, to this day, on a method to resurrect their Dear Leader. Official information regarding Walt's plans after his eventual defrosting have not yet been released by the Disney Corporation; however, an important document was leaked that detailed Walt's plan to be defrosted on New Year's Eve 2082, along with Robin Williams, who was recently added to the same freezer. One of the most popular conspiracy theories surrounding Disney is that he was an active Nazi sympathizer. Art Babbitt accused Disney of meeting frequently with the German American Bund organization, which fanatically supported Adolf Hitler. Disney was also accused of being a Nazi for meeting with Leni Riefenstahl when she was promoting her movie Springtime for Olympia about the 1936 Spring Olympics in Berlin. The idea of Disney being a Nazi has been been given a new lease on life by fratboy comedy television shows such as Family Guy and Robot Chicken. In Family Guy it is used as a recurring gag, such as in the episode "Road to the Multiverse" where Stewie and Brian travel to a Disney-themed universe and a Jewish character is viciously attacked. Of course, many of the show's fans believe that since a TV show (a satirical TV show, at that) told them something, it must be true. On YouTube, there are several creepypastas about either a Nazi Donald Duck or a Nazi Disney movie, made using scenes poorly stitched together and edited from the Disney World War II short films Education for Death and Der Fuehrer's Face. This endures despite the fact that the shorts were supposed to be anti-Nazi propaganda, showing how bad it would be if a good ole' American boy like Donald woke up one day and found that he was living in Nazi Germany. During the Red Scare, kindly old Uncle Walt testified before the House Un-American Activites Committee and pointed the finger at several animators and union organizers who had previously worked for him, claiming that the Screen Cartoonists Guild was a Communist front and that a strike during production of Dumbo was part of a Commie plot. FBI memos indicate that Disney fed them information until his death. A persistent urban legend is that Walt Disney was cremated in 1966 after dying of lung cancer. This may stem from an interview of pyrokineticist Robert Nelson in a attempt to show that Disney supported the idea of cremation, despite Nelson retroactively stating multiple times that he did not cremate Disney. Disney's family members have repeatedly stated that he was in fact frozen; this is also what appears on his death certificate. ↑ Well, technically Oswald the Lucky Rabbit was, but Walt chose not to talk about that. ↑ That title would probably have to go to Max Goof. ↑ Iceland and Greenland were hardly competition. ↑ Even though Hitler considered the Bund a nuisance interfering in his plan to keep the US neutral. This page was last edited on 22 May 2017, at 05:03.